Bhatura, bhatoora, batura, batoore or bhature is a popular North Indian Fry bread. It is a bread recipe from Punjab, a north Indian state. It goes well with chickpea curry (also called chole or chana masala) and is served in restaurants as chana Bhatura. Chana bhatura or chole bhature is a perfect combination for a filling meal. It is available in the restaurants and is generally served at dinner time or as a snack. There are a few recipes for bhatura. this is one of the easiest. It is made with plain flour and is soft kind of fluffy large poori. Mix together flour, salt, soda bicarb. Add 2 tbsp oil and curd. mix well. Add milk little by little as needed to form soft dough. Knead well. Put in a bowl. Cover with a wet cloth. Cover the bowl with a lid. Keep for 5-6 hours. Knead the dough again. Make big lime size balls. Heat oil and keep on medium heat once it is heated well. Roll the dough into a 5"-6" round. Put the round carefully in the hot oil. Let cook for 5-10 seconds. Turn to the other side and cook for a few seconds. Bhatura will puff up in to a round. Cook for a few seconds. Take care not to let it turn brown too much. Oil should not be smoking hot. The bhatooras will be brown outside but not properly cooked inside. Once heated, oil should be medium hot. Bhatooras are usually lighter in color and are not browned too much. If the oil is not hot enough, batoora will absorb more oil. So it is important to keep the oil at the right temperature before adding the rolled bhature in oil. Bhatura should be served and eaten hot. 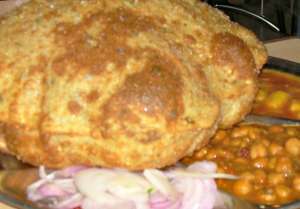 Bhatura is served with Chole/Chana Masala. In restaurants, sliced raw onion, cucumber slices, a lemon wedge is usually served with bhatoora. You may prepare the bhatoora dough and keep it in the fridge for 3-4 days and make bhatoora whenever you want.